The Upholstered DAX Chair brings extra style and comfort to your home with its unique fusion of colours, textures and fabrics. The aesthetical contrast of rich cashmere against the pure white organic shell and polished stainless steel base is visually stunning. While the luxurious, hand-made cushioned interior is baby soft to the touch and invitingly cosy. Perfect for leisurely dining with friends and family, or peaceful afternoons curled up with a good book. The Upholstered DAX Chair can be mixed to great effect with both traditional and contemporary styles. But its modern aesthetics look particularly impressive alongside rustic wood. 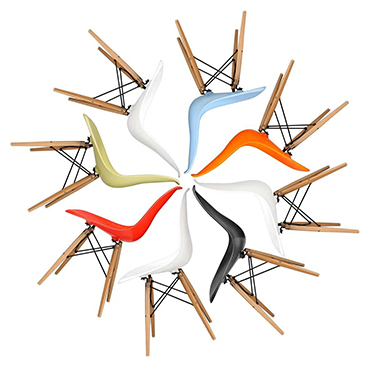 In the late 1940s, Charles and Ray Eames began exploring with the use of plastics in furniture design. The DAX Chair was part of a series of free-flowing moulded chairs that were made from single pieces of plastic or fibreglass. They were the first chairs of their kind and were introduced at Low Cost Furniture Design competition at MoMA in New York Museum in 1950. The chairs were an instant hit and their popularity has grown along with their iconic status. The name DAX stands for Dining height, Armchair with X-base. The X-base is the shape formed when you turn the chair upside down.